And never, not once in twenty two years, has anyone said, “Yes, I am.” Everyone feels they are not getting paid what they are worth, and yet almost nobody does anything about it. Even if I gave you a dozen strategies to raise your rates or to repackage your services for higher value, you’d likely have a problem doing it because your “wealth thermostat” is set at a fixed position that always springs back to where it was. Your wealth thermostat is set for the amount of income you feel comfortable earning in a year. Perhaps it’s $50K or $100K or 200K or $500K per year. And anything much beyond that level is not only uncomfortable to you, it’s downright scary. Do any of the following statements seem true to you? You see money as a scarce commodity that’s hard to get more of (no matter what you earn). You think people that make more money than you do are morally inferior to you (even while you envy them). You find it hard to invest in yourself (workshops, books programs). Investments always looks like expenses to you. When you make good money you tell yourself that it won’t last or that it’s not enough. The glass is always half empty. You feel virtuous when you work hard and do a good job, but feel a little (or a lot) guilty when you charge a high fee. All of these are symptoms of a scarcity mindset. And for some reason, most of us seem to be afflicted with it to one degree or another. Having money naturally flowing into our lives easily and effortlessly is a foreign concept to most of us. What can you do to start moving from a scarcity to a sufficiency or abundance mindset? There are a lot of ways, and I won’t pretend that you can change your whole money mindset overnight, so I want to focus on one simple thing – what you actually charge your clients. What you’re going to do is change the settings on your wealth thermostat. It’s a simple, 5-step process that won’t take long and will help you shift your perception of the value of your services. Make a list of the things you have helped your clients with. This should be a long list that includes everything you can think of. Narrow this list down to just five clients that you had the most success with and try to estimate the actual value each client received from you. Make it as tangible as possible. Next ask yourself, given the actual value that each client received, what would be a fair price for your services? How does this compare to the price you actually charged? Now take this new, fairer price that’s based on real value provided and double it. So if you originally charged $1,000 and a fair price would be $2,000, then write down $4,000. Then do this exercise out loud (with yourself or a friend): What’s your price for this project? You: The price for this project is $4,000. Repeat several times over a period of time until it feels natural and easy to say it. The next time you quote a price at the real value of $2,000, it will seem very reasonable, if not downright cheap. You will have shifted your wealth thermostat and it will feel much more comfortable charging higher fees. Not only that, the prospect will show less resistance in paying those fees. As this new wealth setting becomes a reality for you, it becomes a reality to others. You’re as wealthy, successful and as valuable as you think you are. 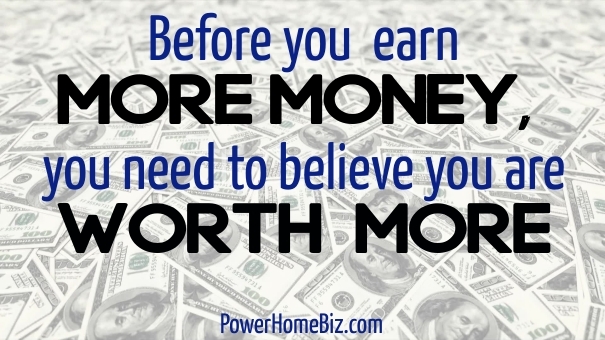 Before you earn more money, you need to believe you are worth more. Change your wealth thermostat and money will start to come more easily, with less struggle.